Birmingham, Alabama's Dart League Homepage. League starts play in January 2014. Looking for a reason to meet people, drink beer, and have a good time? Join the Birmingham Dart League. The city's ONLY steel tip league!!! Each team will have their home bar. A season will consist of ten matches over ten weeks, with playoffs at the end. Five matches will be played at your home bar and five matches will be played at other people's home bars. So ask your bartenders about forming a team for their bar. Each week a match will consist of sets of both singles and doubles of 301, 501, and cricket. As players win games, they earn a point for their team. The team with the most points at the end of the night wins the match. Matches will start at 7:00 pm on Tuesdays. For more detailed explanation visit the weekly matches page. Signing up is so easy! All you must do is find a bar, find at least four players (ideally more), and write an email to birminghamdarts@gmail.com. 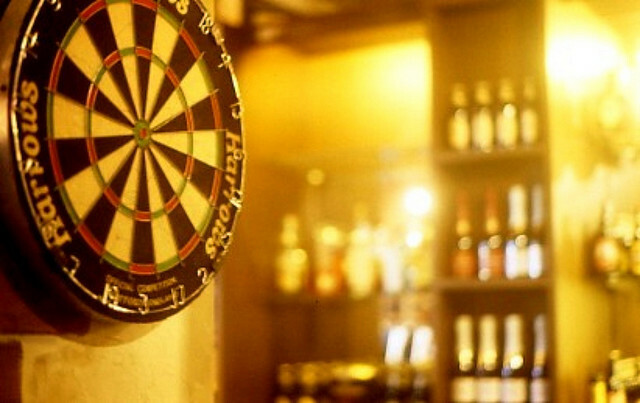 If you are an individual who wishes to play, Birmingham Darts will try and match you up with a team. All are welcome, from beginners to experts. The Birmingham Dart League is based in Birmingham, AL. We are a player-centered organization with teams having home bars as well as traveling to other establishments around the city. Sign up now. League has been active since January 2011. Get updates concerning tournaments, league play, drink specials, etc.